dessert | Welcome to the world of NECCO! After Wednesday’s Sweethearts Series post, our sweet tooth really kicked into high gear! Today, we bring you another yummy treat that will satisfy your taste buds and also be the perfect addition to any Valentine’s Day celebration: funfetti cupcakes! This flavor really reflects the fun you have spending times with loved ones and is the perfect mix to complement our multiple flavors of Sweethearts. To decorate these cupcakes, we love picking Sweethearts that have our favorite messages on them and placing them on top for each special guest. These delicious Cupcake Creations make for a delicious personal treat that you’ll want to make over and over again! Pre-heat oven to 350°F or slightly warmer to 375°F depending on the size and strength of your oven. Line your cupcake tray with cupcake liners. In the medium mixing bowl, gently whisk together the flour, baking powder, and salt. Set aside. In the large mixing bowl, use a kitchen or hand mixer to blend together the sugar and the butter. The speed best used is medium-high, and it should be beat until the mixture is completely blended and has a fluffier texture to it. You want to blend until there are no clumps. Add the egg and egg whites, one at a time, into the large mixing bowl, and again using the mixer, beat until the eggs are completely blended into the butter/sugar mixture. Once this is completely combined, blend in the vanilla extract until completely combined. Thoroughly mix to avoid clumps of ingredients. Once ready, gradually stir in the dry mixture from the medium mixing bowl and the milk in increments to the mix. On a low speed, use the mixer to blend until ingredients are just combined. Add the sprinkles/jimmies into the mixed batter and carefully, using either your hands or a frosting spatula, work them evenly throughout the mix. Pour the mix into the lined cupcake tray 2/3 of the way full in each liner. This will give the cupcakes room to expand without overflowing when they bake. Bake for approximately 18 minutes. You do not want to over-bake here. The best way to tell that your cupcakes are ready is to use a tooth pick to poke into the cupcake. When it comes out clean without cupcake batter on it, they are ready. Tip: it’s sometimes helpful to rotate the cupcake tray halfway through baking to ensure complete baking coverage. Remove the cupcakes from the oven and move the tray to either a wire cooling rack or a cooled counter top in order for them to cool completely; allow several minutes for them to cool. Note: It is very important to wait this out. Attempting to frost warm cupcakes will tear up the top of the cupcake. Once cooled, use either a frosting spatula or a frosting pastry bag, to frost the cupcake. 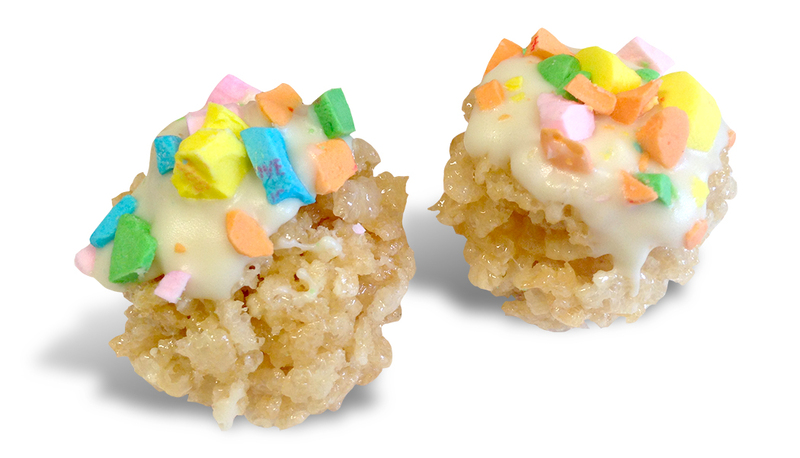 We added some colored sugar sprinkles on top for show. 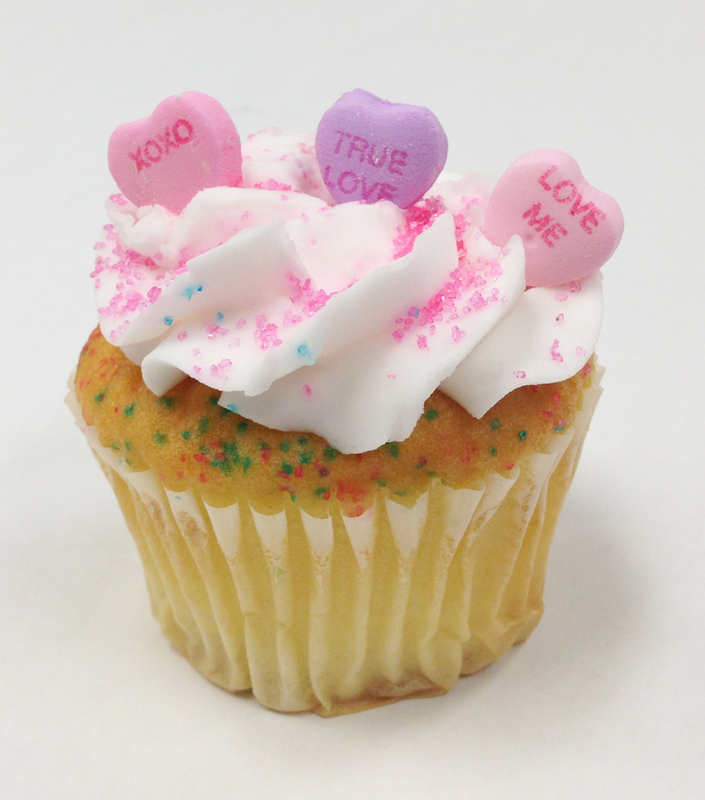 Decorate your frosted cupcakes with Sweethearts featuring your favorite sayings, and then it’s time to share and enjoy! Categories: Recipes, Sweethearts Series, Valentine's Day | Tags: Boston, candy, Candy Hearts, conversation hearts, cupcake, cupcakes, dessert, diy, family, food, funfetti, funfetti cupcakes, gifts, holidays, love, NECCO, new england confectionery company, party, party food, partys, recipe, snack, sprinkles, sweet, Sweethearts, sweets, Valentine, Valentine's Day, Valentine's Day Candy, Valentine's Day recipe | Permalink. 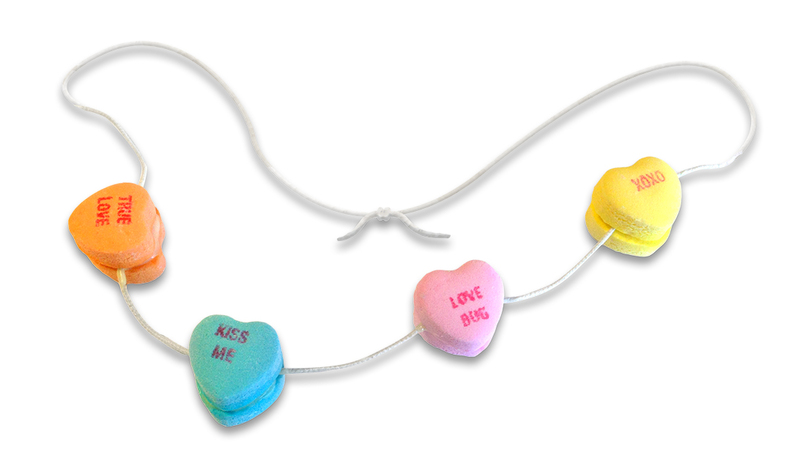 Sweethearts Series: Valentine’s Day Candy Necklace! Second day of Sweethearts Series, and this treat is one of our favorites! It’s very simple to make but is sure to be a hit with the kids! Candy can create some of the sweetest memories during your childhood, and you always remember your favorite sweets and the happy feelings you had with them when you were growing up. Some of the most fun was had with the novel items, like candy necklaces, that kept you laughing endlessly with how unique, and sometimes silly, they were. Today, we hope to capture some of that sweet, sweet childhood fun with our very own Valentine’s Day Candy Necklace! So, grab these few supplies, and get ready for you and your little one to share some laughs as you enjoy this delicious treat! Place a Sweetheart onto a microwave safe plate, making sure the text is facing down towards the place. Place one of the white chocolate chips centered on the Sweetheart and microwave this for about 15-30 seconds to soften the chocolate. Take a piece of food-safe string, and press it down on the melted piece of chocolate. Take a second Sweetheart with the text facing up, and place it on top of the chocolate and string. Press together firmly yet delicately. Repeat this as many times as you’d like on the string. Prior to placing it on your neck, let cool at least one hour for chocolate to set. Enjoy! Categories: Crafts, Sweethearts Series, Valentine's Day | Tags: Boston, candy, Candy Hearts, Candy Necklace, conversation hearts, conversation hearts crafts, crafting, crafts, crafts with kids, dessert, diy, food, gifts, holidays, love, NECCO, necklace, new england confectionery company, sweetest memories, sweetheart, sweets, Valentine, Valentine's Day, Valentine's Day crafts | Permalink. 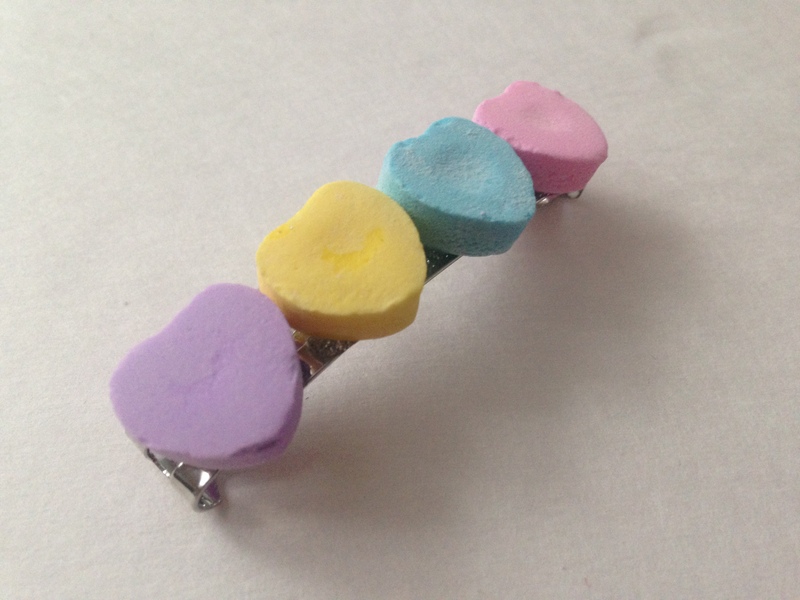 Sweethearts Series: Valentine’s Day Hair Clip! Valentine’s Day is definitely our favorite time of the year. It’s a time filled with love and special sweet surprises for all of the important people in your life! Our beloved longtime classic candy, Sweethearts, is a staple for this season. Fans love to eat and share these little sweets with the cute sayings on them; they also love using them in holiday recipes, crafts and decorations. In celebration of this, we will be having a Sweethearts Series up until Valentine’s Day filled with our favorite recipes, crafts, decorations and more. 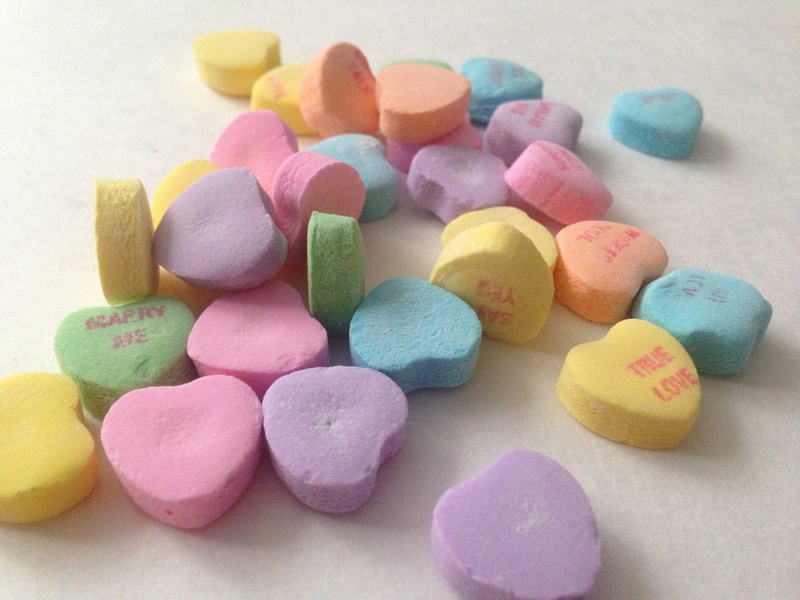 Many ideas are inspired by our amazing Sweethearts and NECCO fans! 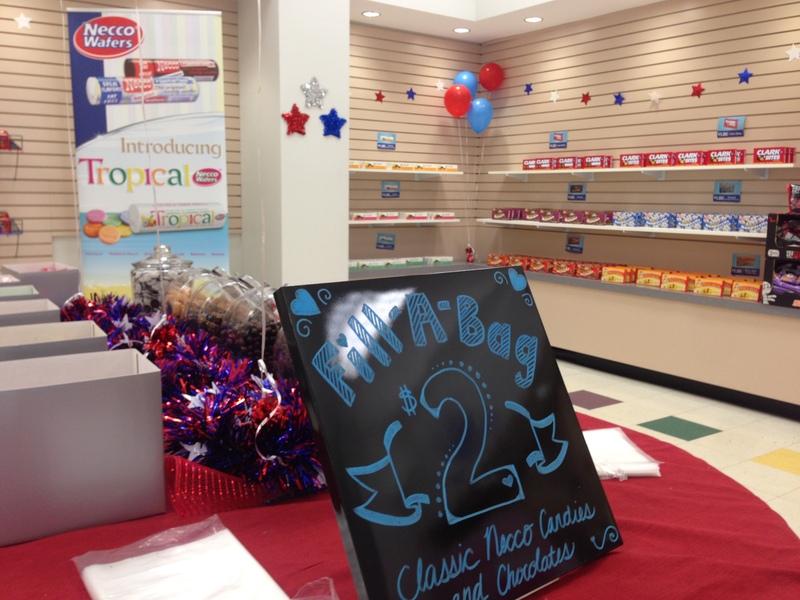 Stay tuned here on our World of NECCO Blog for all of the fun! Today, we have a quick Valentine’s Day hair clip DIY. 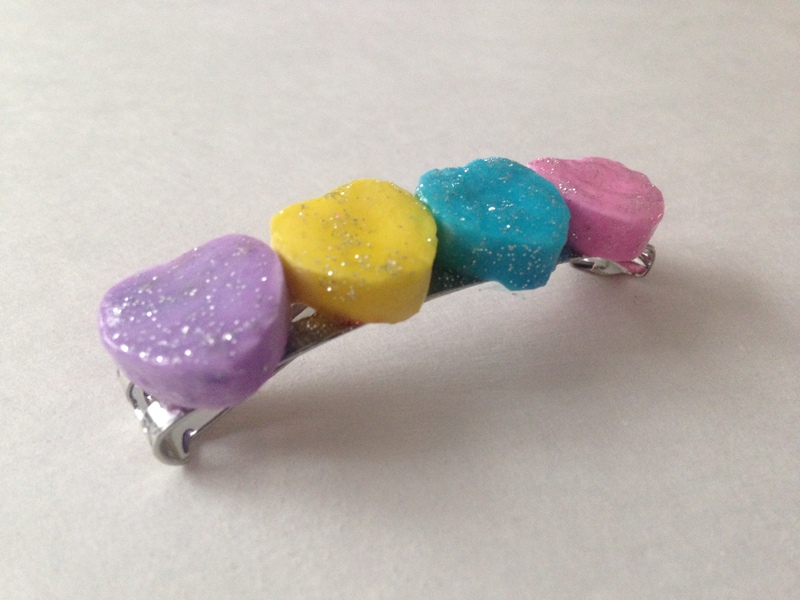 It’s the perfect accessory for your little Sweethearts fan to wear to school or to play with friends! [And who says you can’t wear one yourself! 😉 ] With very few supplies and a couple of minutes, you’ll be on your way to starting your Valentine’s Day celebration with Sweethearts! Enjoy & be sure to check in again tomorrow! 1. 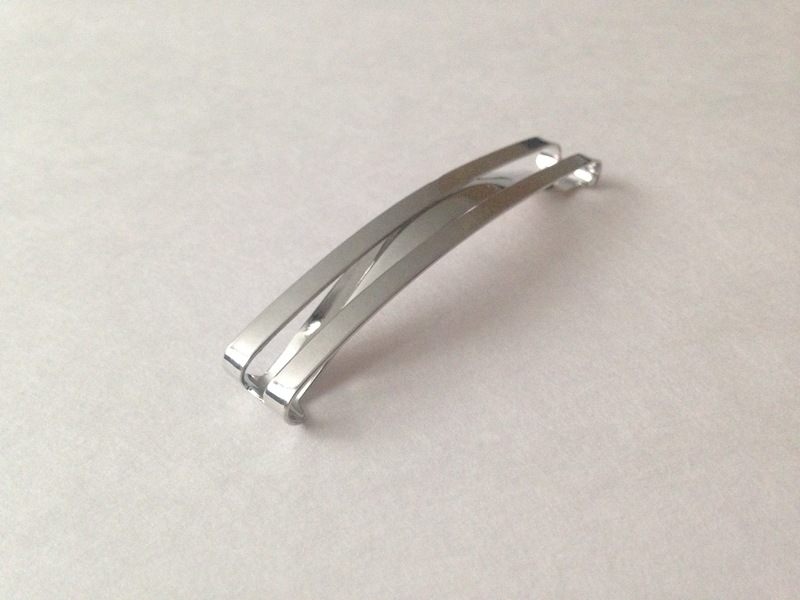 Clean your hair clip to make sure there’s no dust or dirt. This will help the glue and Sweethearts adhere better to the clip. 2. Take your squeeze glue bottle or crazy glue and spread a thin line along each edge of the hair clip. Then, line up four Sweethearts (or more if you have a bigger clip) and press each one firmly yet delicately onto the clip. 3. Pressing firmly helps to set the glue properly. Allow it to dry completely. Once dry and Sweethearts are secure to the clip, take the glitter glue and squirt a small dollop onto each of the Sweethearts. Using either your finger or a small paintbrush, evenly spread the glitter glue all over the exposed portions of the Sweetheart. Categories: Crafts, Sweethearts Series, Valentine's Day | Tags: Boston, candy, Candy Hearts, conversation hearts, crafting, crafts, dessert, diy, DIY hair, friends, hair clip, hair piece, hair styling, holidays, kids crafts, love, NECCO, new england confectionery company, style, Sweethearts, sweets, Valentine's Day, Valentine's Day Candy, VDay | Permalink. In celebration of Halloween, NECCO will be having a special opening of their candy store at their Revere, MA world headquarters! It will be packed with all the classic treats, like NECCO Wafers, Sky Bars, Clark Bars, and Haviland Thin Mints, and also feature an assortment of our Halloween treats such as Mary Jane Peanut Butter Kisses, Zombie Food, Sweethearts Mummy Hearts and NECCO Bat Wing Wafers! Categories: Uncategorized | Tags: Boston, candy, candy buttons, candy store, chocolate, Clark Bar, Clark Bars, dessert, diy, events, family, food, gifts, Halloween, Halloween Candy, Haviland, Haviland Thin Mints, holidays, love, Mary Jane Peanut Butter Kisses, Mary Janes, NECCO, necco wafers, new england confectionery company, nonpareils, peanut butter, Sky Bar, Sky Bars, Slap Stix, Squirrel Nut Zippers, Sweethearts, sweets, Thin Mints, Tropical NECCO Wafers, Zombie Food | Permalink.